I can’t help but think that Jason Segel will be terrific as David Foster Wallace in a planned biopic based on a book I liked a lot back in 2010. Even though, as the Los Angeles Times points out, Segel has “made a career out of playing adorable goofy guys,” interviews and subtext in some of his film roles reveal the possibility that we will be treated to a more thoughtful and darker side of Segel as he plays the brilliant author who killed himself in 2008. The Wrap tells us that James Ponsoldt will direct from a script by Donald Margulies. 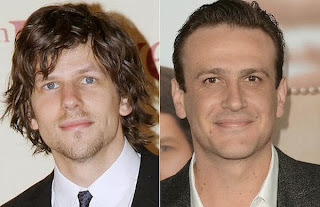 Jesse Eisenberg (above left) will portray Lipsky. Production is scheduled to begin early in 2014. Birthday for an Author: Let Them Eat Cake!